Problem 6.1. A man is performing dumbbell kickbacks to strengthen his triceps (Fig. P.6.1). He weighs 55 kg. His forearm and his hand together constitute 2.5% of his body weight. The length of his forearm is 26 cm. The lever arm of the triceps with respect to the center of rotation of elbow is 2.4 cm. The weight he carries is equal to 5 kg. Assuming that the man performs the dumbbell kickbacks slowly, determine the triceps force as a function of angle 6 his forearm makes with the vertical axis. Answer: FT = 604 sin 6 N.
Problem 6.2. The man performing the dumbbell kickbacks in Problem 6.1 wants to know how the rate of rotation of his forearm affects the ease of the exercise. So, he begins to raise his forearm from vertical to horizontal position as quickly as he can, still using the same weight. When his forearm makes 45° with the vertical axis, the angular velocity and angular acceleration of the forearm becomes -8 rad/s and -28 rad/s2, respectively. A minus sign associated with angular velocity refers to clockwise rotation of the right hand. Determine the force produced by the triceps at the elbow at the instant considered. Ic = 0.021 kg-m2. Answer: FT = 478 (N). Figure P.6.3a,b. A dancer in arabesque position (a). The free-body diagram of the foot that is touching the floor is shown in (b). Problem 6.3. 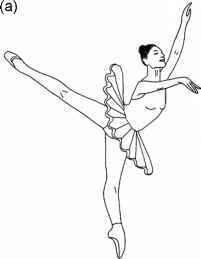 A dancer weighing 46 kg takes the arabesque position shown in Fig. P.6.3. Determine the force in her Achilles tendon. Various dimensions concerning the structure of her foot are marked in the figure. Figure P.6.4. A dancer performing a leg-swinging spin. tic equilibrium hold. He weighs 66 kg and his height is 1.71 m. Using the data provided in Appendix 2 (section on body segment properties), determine the moment created by the weight of the raised leg at the hip joint of the dancer. Which muscle group is principally responsible for keeping the lower limb horizontal as shown in the figure? Can you provide an estimate of the force generated by the contracting muscle? Figure P.6.5. Some arm and leg movements used for physical conditioning. form the exercises yourself and determine the resistance for which you can comfortably repeat the movement at least six times. If you need additional data, consult an anatomy book and make educated guesses. 0 = 45°, F = 1181 N, l = 22.6 cm 0 = 0°, F = 4841 N, l = 24.8 cm. Figure P.6.6. The use of the pectoralis muscle group in flexing the arms while in supine position. The geometric parameters such as the points of origin and insertion of pectoralis (points A and B) are identified. Remark: The force produced by the pectoralis muscle to lift the 10-kg dumbbell is enormous. In the human body, practically all muscular moment arms are short in proportion to the levers they move. As a result, muscles generate forces that are significantly greater than the load to be moved. This seeming disadvantage of the human body is in fact an advantage in certain circumstances. This advantage can be clearly illustrated in this problem. Having a short moment arm for the pec-toralis means that a very small movement of the short end of the lever is magnified in direct proportion to the length of the arm. 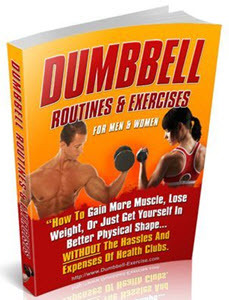 Thus, a small shortening of the muscle would move the dumbbell 90°. As the dumbbell moves a much larger distance than the attachment point of pec-toralis to humerus, it is clear that contraction of the chest muscle can produce large velocities at the wrist, which is quite useful in tennis and many other sports involving throwing motion. Problem 6.7. When an individual stands on one foot, the loaded knee supports the body weight (Fig. P.6.7). The line of application of this force is at a distance of 14 cm away from the center of rotation of the knee. The person weighs 68 kg. Determine the tension in the muscle-tendon complex composed of the gluteus maximus, the tensor fasciae latae, and the illiotibial band. The moment arm of this complex with respect to the center of rotation of the knee was measured to be 5 cm. Answer: T = 1868 N.
Figure P.6.7. An individual standing on one foot. The weight acts eccentrically on the knee. Figure P.6.8a,b. Stretching of the whole body by holding onto a horizontal bar (a) or by suspending with feet up (b). 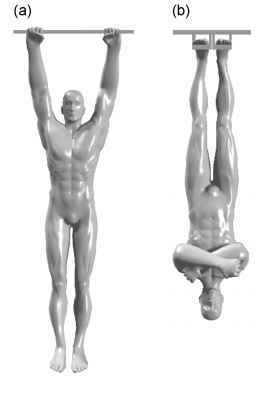 vertical position, again stretching his body (Fig. P.6.8b). in the third configuration the man stands still on his feet. Determine the axial force at his neck, waist, thighs, and ankles. Determine the average normal stress at these locations. The man weighs 68 kg and he is 1.78 m tall. The cross-sectional areas of his neck, waist, thighs, and ankles are 66, 280, 88, and 41 cm2, respectively. use the data given in Appendix 2 to determine other input parameters you may need in your computations. Assume that this internal force system is carried by the tibia. Both the axial force F1 and the moment M lead to normal stresses in the bone. The tangential force F2 leads to shear stress and therefore is not considered further. The normal stress distribution from F1 is uniform in the cross section. The normal stress distribution from M, on the other hand, varies linearly as shown in Fig. P.6.9c and can be computed by using Eqns. 6.33 and 6.34b. To calculate the normal stress at a certain point in the cross section, one must add both contributions. 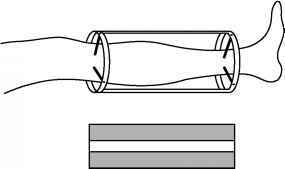 In the addition, tensile stress is considered positive, compressive stress negative. Answer: a = (4,111 - 80) N/cm2 = 4,031 N/cm2. Figure P.6.9a-c. While she is climbing stairs, the high heel of a woman's boot gets stuck in a small hole (a). 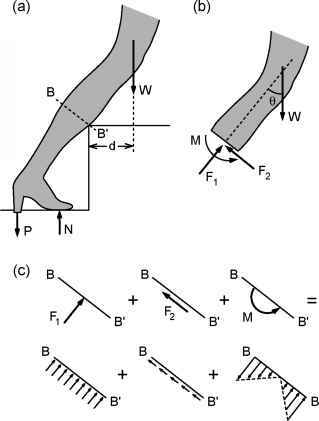 The free-body diagram of the woman's leg minus the lower part is illustrated in (b). The resultant stress distribution on the cross section BB' is schematically shown in (c). Problem 6.10. Determine the axial stress versus axial strain curves of three specimens obtained from materials such as various fabrics, strings, springs, or leaves and branches. Fix the specimen at one end and apply weights at the other. Videotape the elongation of the specimen under the application of the load. Quick-capture and digitize the data using a computer and plot stress versus strain. How would you determine the cross-sectional areas of your specimens? If a specimen has a constant depth, like that of a fabric, one could use the parameter (force divided by the width of the specimen) as a substitute for stress. Figure P.6.11. 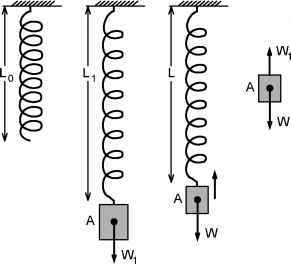 Contraction of a spring from a prestretched position. The weights W and W1 correspond to masses m and m1, respectively. velocity v* is the velocity of m at 0.1 s after the spring-mass system is released. Use the following parameter values in plotting v* as a function of the relative load m/mr. mi = 0.5 kg, Lo = 20 cm, k = 100 N/m. Compare your results with the force-velocity relationship of a contracting skeletal muscle fiber. Note that the contraction velocity V that was defined in the text is dimensionless. It would be equivalent to the term v*/L1 in this problem. Figure P.6.12. The limb-lengthening procedure on a patient whose left leg was 5 cm shorter than the right leg. The leg is positioned horizontally in the figure. Figure P.6.13. The force acting on the thigh bone femur during the standing position. AA' in the soft tissue when the lower leg is positioned horizontally immediately after the bones of the lower leg were cut into two? Answer: a = 0.91 N/cm2. Problem 6.13. Determine the force FM produced by the principal abductor muscle gluteus medius and the total hip joint force Fj during the standing position shown in Fig. P.6.13. The lever arm c of gluteus medius with respect to the center of rotation of the hip is equal to 7 cm. The parameters d, d1r and d2 are 36, 37, and 16 cm, respectively. The man weighs 73 kg. Problem 6.14. The femorotibial joint is not a simple hinge, but the bone force Fr acts at a distance d = 2.4 cm from the center of rotation (Fig. Figure P.6.14. Anterior view of the knee joint. The stress-bearing area is dual-cup shaped. The joint force transmitted from femur to tibia lies at a distance d = 2.4 cm away from the center of rotation of the knee. P.6.14). Compute the joint force FR and the tension T in the gluteus maximus for an individual standing on one foot. 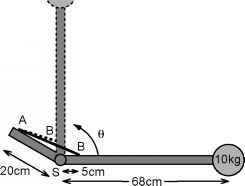 The lever arm of the weight P = 540 N is about L = 14 cm. The lever arm of the tendon of gluteus maximus h = 8.1 cm. Answer: T = 597 N, FR = 1137 N.